The volcanic soil of the Penja valley in the West African nation of Cameroon produces the world's most coveted white pepper, prized by Michelin-starred chefs and sold by specialty online shops including Edelices Gourmet Food in the United Kingdom. With a delicate musky flavor, Penja pepper fetches as much as 31.25 euros ($35.65) per 100 grams (3.5 ounces) at Edelices, compared with the equivalent of 2.80 euros for the ordinary white variety at Tesco supermarkets. It's one of three African foods to obtain the protected geographical indications label under a system that the European Union wants recognized worldwide. "It's got herbaceous, grassy notes, with a great flavor, and it doesn't burn," said chef Lior Lev Sercarz, who buys about 150 kilograms (331 pounds) a year for his luxury spice shop La Boîte in New York's Hell's Kitchen district. "Most white peppers are mediocre because they aren't dried properly and a bit fermented and bitter. But I've never had a bad Penja pepper." Originally from India, the peppercorn is a rarity in Africa. While Madagascar produces small quantities, Cameroon is the only country on the continent where it's grown on a large-enough scale to be reflected in export statistics. Local lore has it that pepper was first brought to Cameroon by a French colonial officer, who planted the vine on his banana plantation in the 1930s. 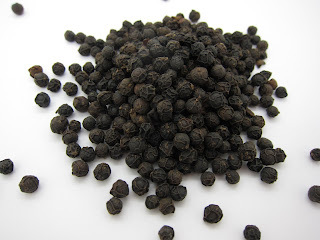 What's certain is that Penja pepper owes its rise to prominence to French entrepreneur Erwann de Kerros, who came across a farm while traveling in Cameroon in 1992, stayed for four years, and began cold-calling chefs and culinary journalists on his return to tell them about his discovery. "I began sending samples around, from Paris to Barcelona to Madrid, and when they complained they couldn't grind it, I sent them pepper mills with Penja," De Kerros from the central French town of Notre-Dame-d'Oé. "I'm selling 400 spices now, but I still love Penja. It's the soul of my company. And it's been a very positive story for the producers, they are very well organized now." Today, De Kerros, 45, runs Terre Exotique, a well-known spice company with almost $10 million in revenue. Among De Kerros' customers are Lior Lev Sercarz and the luxury department store Harrods in London. Production has surged to 300 metric tons a year, from barely 18 tons five years ago, as prices paid locally have shot up more than fivefold, persuading hundreds of people to take up pepper farming. "I have three children at the University of Yaounde and they're not complaining," Rosalie Mbantchoui, a farmer, said in between chanting religious songs with a half dozen women as they sat at the Penja market sorting peppercorns by size. Before Penja pepper was awarded the label in 2013, farmers got about 2,500 CFA francs ($4.30) per kilogram, up from a paltry 600 francs in the 1990s, when it was barely known. Today, they receive at least 14,000 CFA francs ($24) a kilo. The GI label protects qualities unique to the region where they are produced, such as Italy's Parma ham and France's Roquefort cheese. White honey from a Cameroonian forest and coffee beans from Guinea's Mount Ziama region also got the distinction in 2013. "The GI label restricts the use of a product's name -- it means that no one else can use it," said Didier Chabrol, a social scientist at the French research institute Cirad who helped the farmers in Penja obtain the certification. "It boosts the reputation of a product and it really helps the producers, even the smallest ones." The geographical indications system is a key stumbling block in trade talks between the United States and the EU, which are trying to sign the Transatlantic Trade and Investment Partnership before the end of the year. While the U.S., which uses trademarks, opposes the global spread of the group's system, the EU has been rallying supporters. So it's no coincidence that the African Intellectual Property Organization, a union of 17 mainly French-speaking countries, has been championing the label in Africa with French financial support and technical expertise. The organization is based in Cameroon, a former French colony. "There are huge economic benefits," said Michael Blakeney, a law professor at the University of Western Australia who has advised nations from Asia to Africa on intellectual-property rights. "You can charge between 8 and 10 percent more for a product that's sold under the geographical indications label. Another benefit is that it protects rural economies: farmers remain where they are if their product is profitable." That's all helped cement the pepper's reputation and convinced some Cameroonians to abandon traditional crops such as coffee and cocoa, said Rene Claude Metomo, 57, who owns the largest pepper plantation and heads the local farmers' cooperative. "In just three years since 2013, we have welcomed some 200 new farmers," Metomo said in an interview at his spacious white-painted villa, with four cars including a Mercedes Benz 500 in the driveway, that overlooks the valley. "That's a strong message regarding the potential we have in Penja pepper cultivation." Six more African products may be awarded the GI label in the near future, according to Paulin Edou Edou, general manager of the African Intellectual Property Organization. "Only a few years ago, the notion of intellectual property was unknown in Africa," Edou Edou said. "Now, countries are lining up to have products registered." The interest for Penja pepper from newcomers means the cooperative has its hands full to ensure that everyone receives training about the production process, including the correct use of fertilizers. Pepper blooms at the start of the rainy season and matures between November and February. Vines require daily tending and it can easily take three years from planting to harvesting. After picking, the peppercorns are soaked in barrels of water to ferment for 10 days before they're gently mashed to remove the pulpy skins. They're then dried in the sun. "The challenge in the near future won't be so much increasing the price; the challenge is to keep up the production standards outlined under the protocol for the GI label," said Chabrol. "If the enthusiasm for Penja pepper persists, it will become harder to ensure quality standards."